For the former hockey club, see Edmonton Eskimos (ice hockey). For the former baseball club, see Edmonton Eskimos (baseball). The Edmonton Eskimos are a professional Canadian football team based in Edmonton, Alberta, competing in the West Division of the Canadian Football League (CFL). The Eskimos play their home games at The Brick Field at Commonwealth Stadium and are the third-youngest franchise in the CFL. The Eskimos were founded in 1949, although there were clubs with the name Edmonton Eskimos as early as 1895. The Eskimos are the most successful CFL franchise of the modern era (since 1954) having won the league's Grey Cup championship fourteen times, second overall only to the Toronto Argonauts who have won sixteen. This includes a three-peat between 1954 and 1956 and an unmatched five consecutive wins between 1978 and 1982, and most recently in 2015. The Eskimos hold a North American professional sports record by qualifying for the playoffs for 34 consecutive years between 1972 and 2005. Edmonton has had the most regular season division championships in the modern era with 21, with their most recent coming in 2015. The team has a rivalry with the Calgary Stampeders and are one of the three community owned teams currently operating in the CFL. Main rivals: Calgary Stampeders (see battle of Alberta) and Montreal Alouettes (11 meetings in the Grey Cup, once in the East final). The Edmonton Eskimos Football Club is one of three "community owned" teams in the CFL (owned by local shareholders). This was once the most common type of ownership in the CFL. In 2006 the Ottawa Sun reported that shares cost $10 each, but were not open to the general public and required the approval of the 80 existing shareholders. This contrasts with the Saskatchewan Roughriders, one of the other community owned teams in the CFL, who have offered shares to the public. The Winnipeg Blue Bombers are the third community owned team. Edmonton Eskimos, Inc., is governed by a ten-member board of directors. The board consists of a chairman, treasurer, secretary six directors and an alternate governor. As of 2011 the board of directors included chairman Allan Sawin, treasurer Bruce Bentley, secretary John Moquin, director Diane Brickner, Chris Bruce, Terry O'Flynn, Harold Roozen, William Scott, Brad Sparrow and alternate governor Rick LeLacheur. The club's president and CEO is Len Rhodes, he is not currently a member of the board. The story of team's name goes back to stories in the press from at least 1903 and possibly as far back as 1892, the first date of a "rugby football" game between Edmonton and Calgary. It is a legacy of the bitter rivalry between the cities of Edmonton and Calgary, the so-called Battle of Alberta. In the early years of sports competition between the cities, the press in each town used colourful nicknames to insult the rival team's home. Edmontonian writers called Calgary "the cow camp", "horse country", or "the little village beside the Bow". Likewise Calgary's responded with insults about Edmonton's northern latitude and frigid weather, calling the city's residents "Esquimeaux" (an archaic spelling of "Eskimos", referring to the indigenous people of the Canadian Arctic, modernly called Inuit). Despite the fact Edmonton is several thousand kilometres south of the Arctic, the name "had the advantages of alliteration, neatness, uniqueness, and a certain amount of truth," and thus, according to historian of Edmonton Tony Cashman, "it stuck." The name remained an unofficial nickname, however until the arrival in Edmonton of American baseball coach and sports promoter William Deacon White in 1907. White founded the Edmonton Eskimos baseball team in 1909, the football Eskimos in 1910, and Edmonton Eskimos hockey team in 1911. Of the three, only the football teams' name has survived. Edmonton played its first series of organized games with the formation of the Alberta Rugby Football Union in 1895. In 1897 the name Esquimaux was adopted. In 1910 the club was officially named the Edmonton Eskimos. Since 1978 the Eskimos have played their home games in The Brick Field at Commonwealth Stadium. They are one of the most successful teams in Canadian football history, having won the Grey Cup more than any other team except the Toronto Argonauts, and being the run-away leader in attendance for many years. 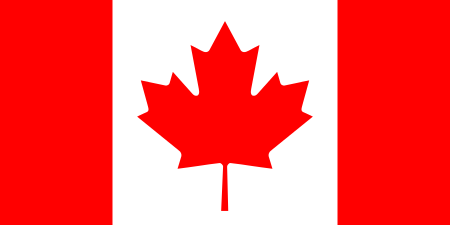 The team holds many impressive records, including five consecutive Grey Cup wins (1978–82) and 34 consecutive years in the playoffs (1972–2005); the latter is a record no other North American professional sports team has equalled. Former Eskimos have figured prominently in Alberta political life: past players include two former provincial premiers (Peter Lougheed and Donald Getty), a former mayor of Edmonton (Bill Smith), and a lieutenant-governor (Norman Kwong). During the glory years of the late 1970s and early 1980s, the Edmonton Eskimos won five Grey Cup championships in a row (1978–82). Since Edmonton re-entered the CFL in 1949, only one other team—also Edmonton—has managed to win three championships in row (1954–56), let alone five. The achievements during the Eskimos dynasty were documented in the book, Decade of Excellence, with photographs by Bob Peterson. The Eskimos also enjoy the largest average attendance in the league season after season. The current uniform colours, green and gold, were adopted when the Eskimos received uniforms from the University of Alberta Golden Bears football team, which was dormant due to a lack of competition in 1949. The colours have remained since that time, and the Golden Bears maintain them to this day as well. Overall, the jersey and colours have remained essentially the same over the years with only minor modifications. 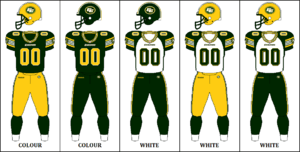 In 2001 the Eskimos introduced white pants to be worn with their away jerseys. In the 2005 CFL season all CFL teams switched to a Reebok designed template but the jerseys for the Eskimos stayed much the same. In that same year the Eskimos introduced an alternate jersey for the first time in the franchise's history. Green pants were also introduced at this time and were worn with their home and away jerseys from 2005 to 2015. The alternate gold jersey was last worn in 2007, as they mainly use their green jerseys. Along with the Hamilton Tiger-Cats and Winnipeg Blue Bombers, they were one of the few teams to alternate the pants and jersey combinations of their uniforms within a season. The Eskimos had their jerseys remodelled for the 2012 season and brought back the green helmets that were worn for the Labour Day game and rematch in 2008. The green helmets were worn with the away jerseys and marked the first time in franchise history that a helmet other than gold was worn as a regular facet of the uniform. It was also the first time in franchise history that two different helmets were worn for home and away uniforms. The team also stopped alternating pant and jersey combinations during this season, using consistent home and away looks all year long. However, during the following season, on August 24, 2013, the Eskimos returned to the all-green combination of green helmets, jerseys, and pants that had not been worn since 2008. The Eskimos first wore their gold helmets with their away uniforms for a regular season game on October 19, 2014 and wore them again in the post-season on November 23, 2014 with matching gold pants. Gold helmets were worn with away uniforms in three of eight regular season games in 2015. In 2014, the team introduced their Signature series alternate uniforms, which was the second alternate uniform to be worn in team history (not including throwback jerseys). With the league switching uniform contracts to Adidas in 2016, the Eskimos again redesigned their uniforms, with the jerseys more closely resembling the simplistic jersey stripe pattern worn from 1996 to 2011. The white jerseys removed the green side-panelling and the team retired the green helmet. The team also removed shoulder numbers, which was the first time the team did not have numbers on the shoulder since 1965. For this season, the team wore gold pants for every game played, including with their Signature series alternate uniforms, which were retained following the Adidas redesign. The Eskimos have a policy of honouring the players who have best represented the team on the field. The player's name, number and seasons played with the Eskimos are displayed on the edge of the concrete separating the upper and lower decks of The Brick Field at Commonwealth Stadium. The Eskimos keep the number in circulation rather than retire them from use. Nanook and Punter are the mascots for the Edmonton Eskimos. They were introduced in 1997 and 2004. ↑ Hall, Vicki (October 15, 2006). "Eskimos left out in cold". Edmonton Journal. Retrieved May 12, 2014. ↑ Seskus, Tony (2007-09-01). "Community ownership a port in CFL's storms". Calgary Herald. Retrieved 2014-05-12. ↑ Canoe inc. "Local ownership 'fraught with uncertainty'". canoe.ca. Retrieved 9 December 2014. ↑ "Board of Directors - Edmonton Eskimos". Edmonton Eskimos. Retrieved 9 December 2014. ↑ "Eskimos". Edmonton Eskimos. Retrieved 9 December 2014. ↑ "Profile: Len Rhodes - Edmonton Eskimos". Edmonton Eskimos. Retrieved 9 December 2014.